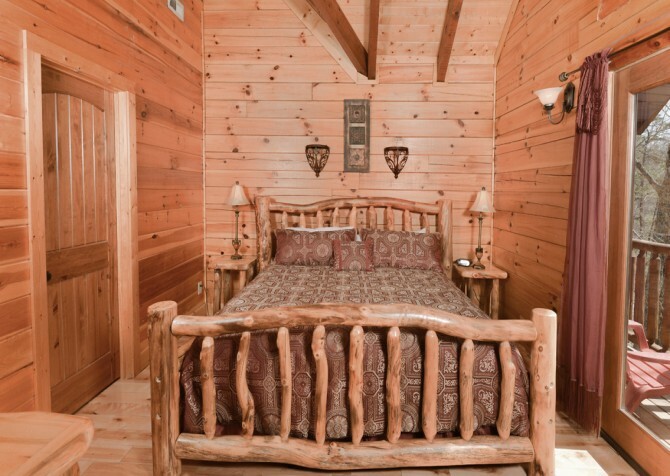 You probably know by the name that one of this cabin’s best features is its private indoor pool. 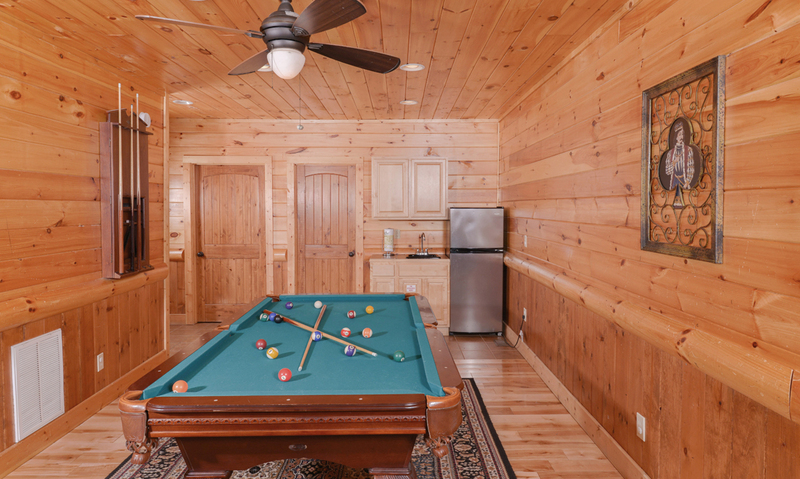 But what you may not realize about Smoky Mountain Splash is that this cabin is not only full of ways to have fun, it’s also full of luxurious updates and modern décor. Smoky Mountain Splash is a modern mountain oasis with room for up to 10 guests. Inside this 3-bedroom cabin, enjoy an updated kitchen, a rec room with a pool table, king-size beds, and a large living room full of natural light. The outside spaces have a lot to offer as well with wooded and mountain views, plenty of porch space to enjoy them from, an outdoor hot tub, and a charcoal grill. 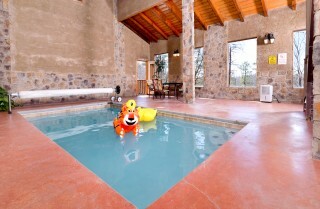 And, of course, don’t forget about the indoor pool that’s just for your group to enjoy! 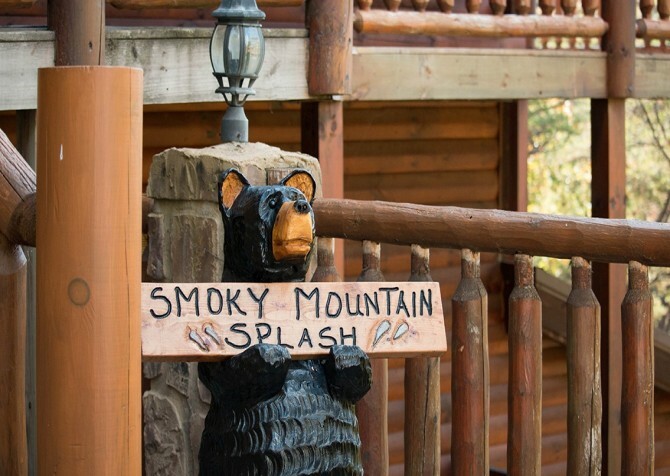 Bring your family or a small group of friends to Smoky Mountain Splash—just a few miles from downtown Pigeon Forge—when you’re ready for a luxurious mountain getaway that’s as relaxing as it is fun. 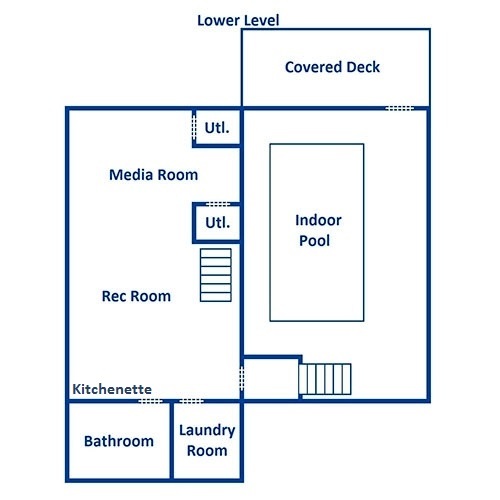 Traveling with a larger group and need more space? Book Smoky Mountain Splash and its neighbor, Splash ‘N Around, for double the space! 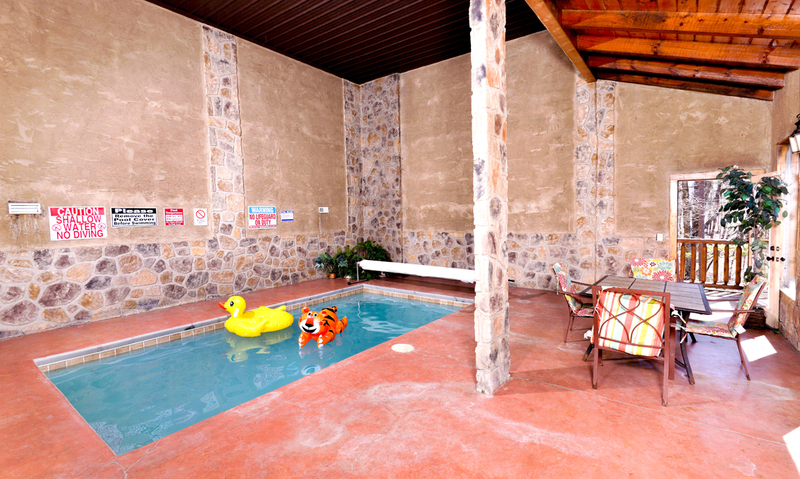 Splash ‘N Around also boasts a private indoor pool and a long list of amenities, so you’ll have double the fun! 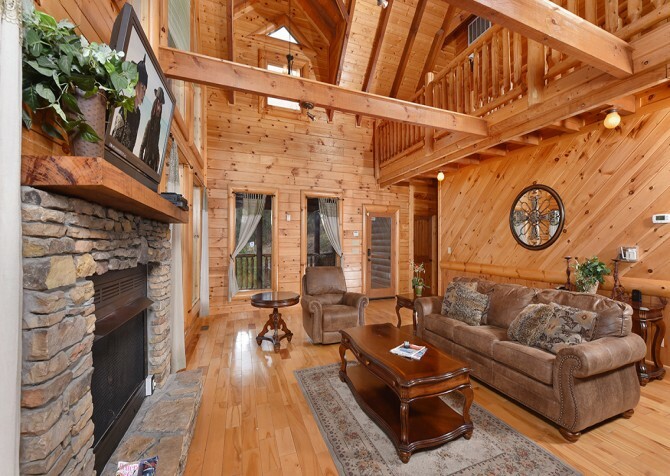 Stepping into the living room of Smoky Mountain Splash, you’ll feel like you're staying at a cabin straight out of the pages of Southern Living magazine. This cabin is as updated and modern as it is bright and open. 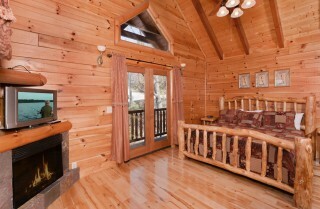 Large windows and high ceilings allow tons of natural light to spill in from the back wall of the cabin. Out of these windows, you’ll enjoy wooded and mountain views, which you can see right from the comfort of your couch. The Smoky Mountain Splash living room actually offers 2 leather couches—1 full-size and 1 companion loveseat. And a rocker recliner adds more cozy seating. 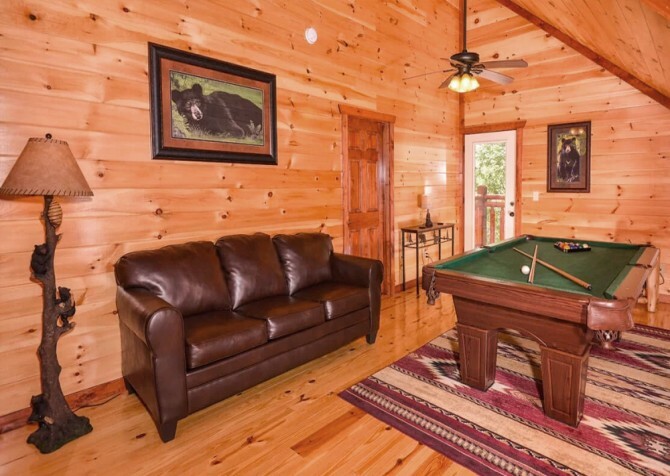 In the corner, you’ll find a set of padded chairs and an end table, where guests are invited to play cards, sip coffee, or converse over drinks. The large coffee table in the center of the living room can serve multiple functions as well, providing a place for board games with the family or late-night snacks while watching a movie on the big screen TV above the fireplace. The stacked stone fireplace—located in the center of the room—is operated by gas, making it convenient for guests to use during their stay. And it will be an absolutely essential amenity for those planning a seasonal Smoky Mountain vacation either during the fall (one of the most popular times to visit the Smokies) or during the holidays for a cozy mountain night. The luxurious kitchen that comes with Smoky Mountain Splash features modern updates and plenty of space to maneuver. 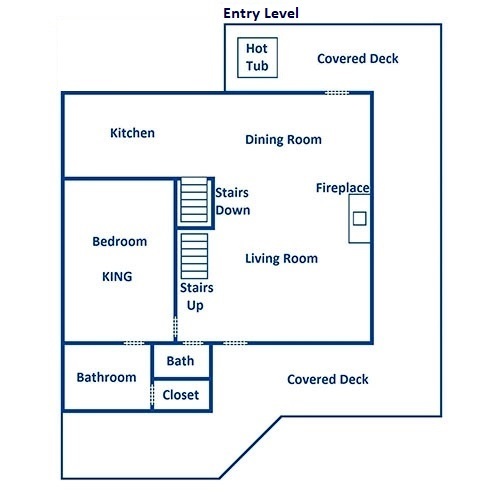 Some updated features you’ll love include track lighting, beautiful oak cabinets, black-and-stainless steel appliances, and a tile countertop. 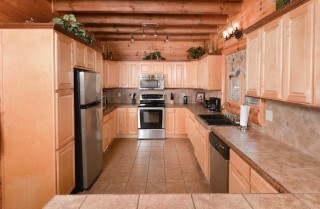 The tile backsplash behind the oven/stove is equally impressive, but this kitchen is more than just nice to look at. 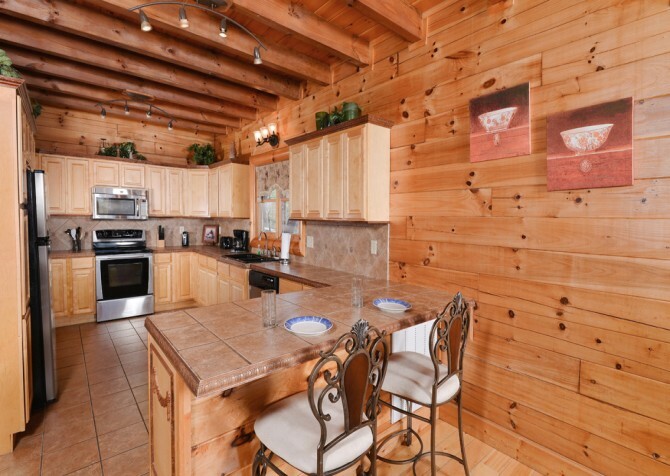 It’s also conveniently designed—with plenty of space for all 10 guests to get what they need during mealtimes—and fully functional, offering all your major appliances as well as a coffeemaker, an electric can opener, a knife set, cookware, and more. This space will come in handy for the nights you want to enjoy a homemade meal with your group instead of driving downtown. It’s also a perfect place to store leftovers from Pigeon Forge restaurants, set out snacks and drinks, and brew a delicious cup of Joe in the mornings. After you’ve made your homemade meals, enjoy them around your beautiful dining room table inside Smoky Mountain Splash. 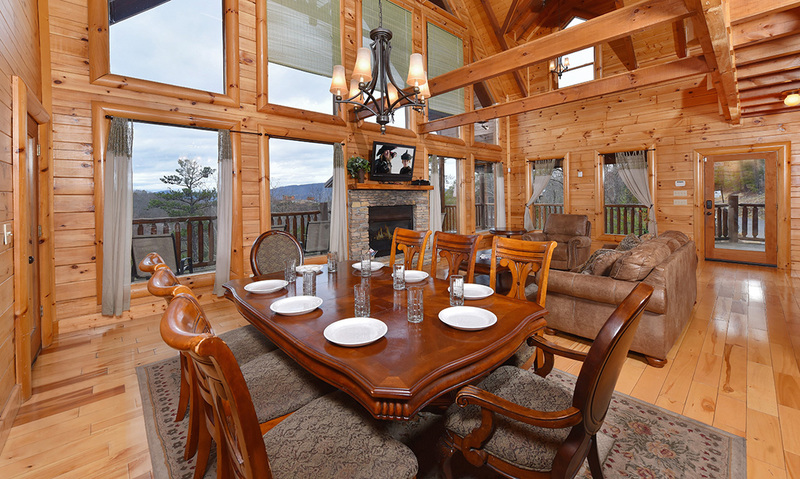 This dining room features an ornate cherry-stained table with place settings for 6. But don’t worry—this cabin also comes with a breakfast bar that’s attached to the kitchen and right beside the dining room. So those not at the table will have a place to dine not too far from others. 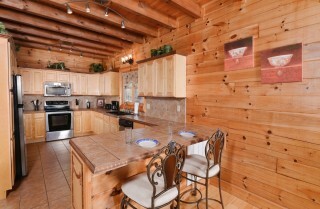 The breakfast bar is also a great option for kids staying at the cabin. During your stay, plan to use the dining table for holiday meals, family-style dinners, big breakfasts, or even a place to store snacks while you play board games as a family. 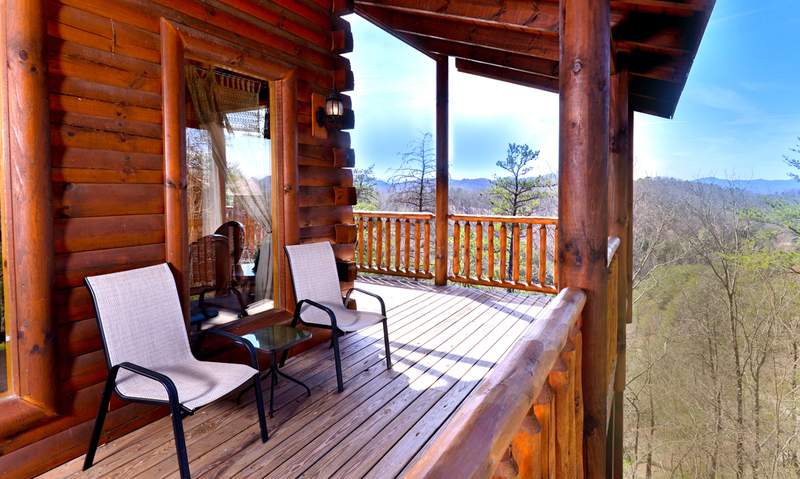 Not only will you enjoy the intimacy of dining within your own cabin, but you’ll also have amazing Smoky Mountain views all around! If your Pigeon Forge getaway is a couples’ retreat or a family vacation, you’ll need a space for everyone in your group to hang out. 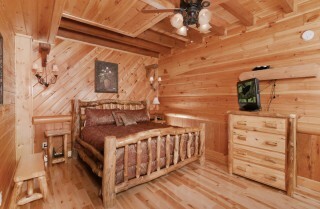 Smoky Mountain Splash provides a perfect option with its fully loaded rec room! 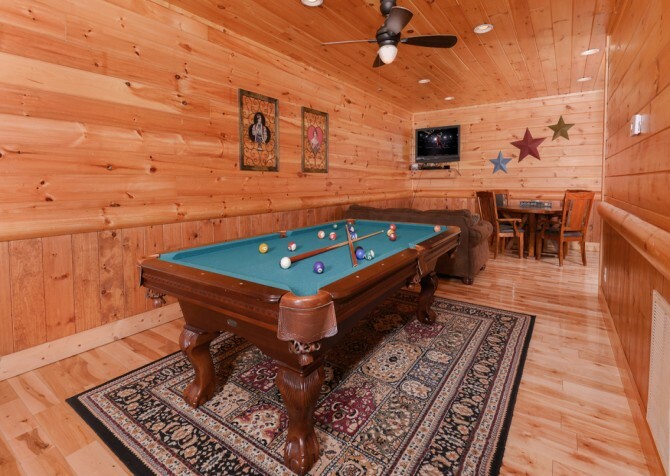 The rec room comes with 2 favorite amenities for kids and adults alike: a full-size pool table and a multicade. 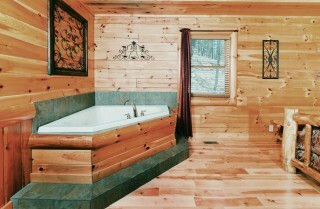 But there’s much more to be enjoyed in this space. 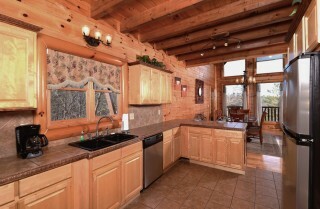 You’ll also find a wet bar with a small refrigerator and cabinet space. 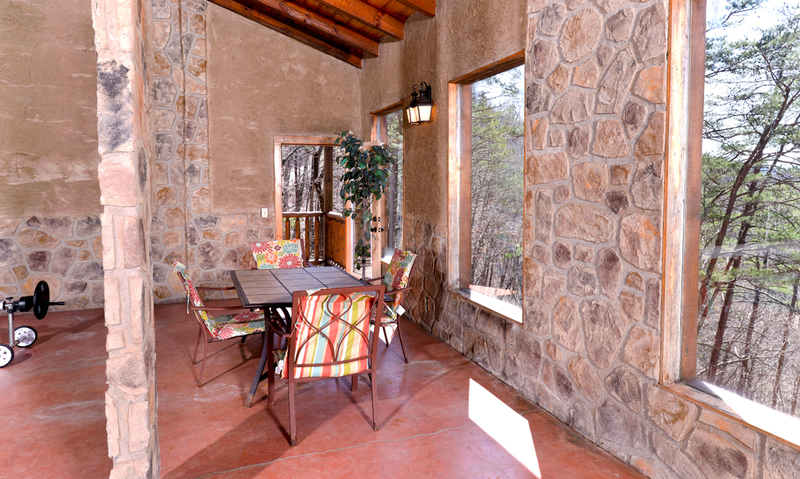 Shake up some drinks or store some cold ones away for when it’s time to relax. Also in the rec room is a cozy sitting space with a large suede couch in front of a big screen TV. Watch the game with the guys or put on a movie for the kids. 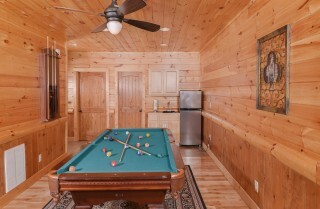 And don’t forget about your card table in the corner! If it weren’t enough to have a rec room for your guests, Smoky Mountain Splash also provides a beautiful indoor pool surrounded by tile as well as gorgeous stone walls and columns. The oversized windows and high ceilings make this room feel huge, and the pool is perfect for splashing, floating, and playing. 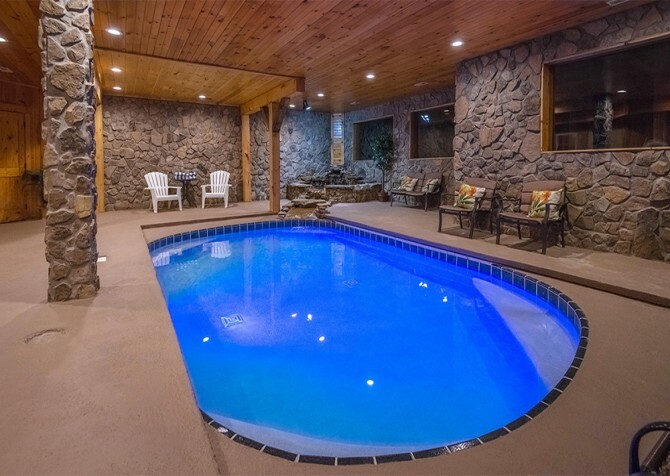 The indoor pool at Smoky Mountain Splash is a great option for cooling down in the summer, but you don’t need to wait until it’s warm outside to use this amazing amenity. 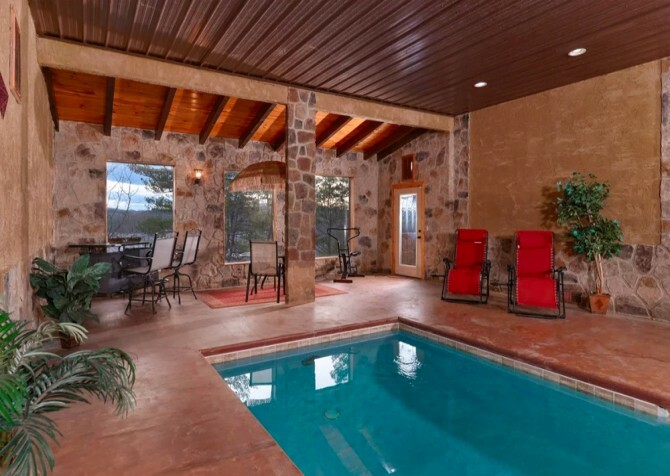 The climate-controlled room and 85-degree pool make this a great way to splash around no matter what time of year you decide to visit. 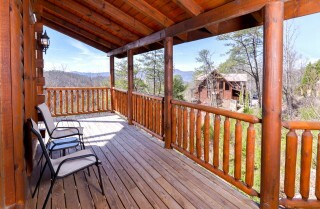 Even if you don’t want to swim, you can still use the patio set in this space for playing games or enjoying meals in front of the large windows that offer views of the Smoky Mountain trees. 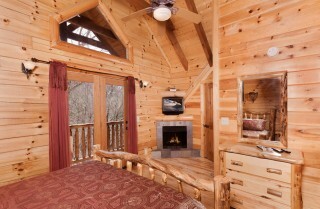 You don’t have to sacrifice luxury when you come to the Smoky Mountains. 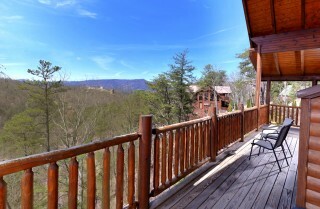 At this Pigeon Forge cabin, you’ll find a modern mountain oasis with top-notch amenities and amazing mountain and wooded views. The luxurious design continues into the bedrooms of Smoky Mountain Splash. Total, this cabin offers 3 bedrooms and 4½ bathrooms with an additional sleeper, meaning you’ll have comfortable accommodations for up to 6 guests during your Pigeon Forge getaway. 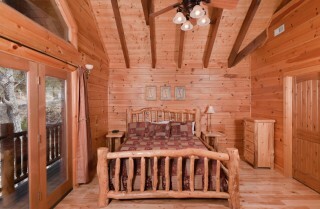 Each bedroom comes with a king-size bed and its own TV. You’ll also find log-style furniture, updated fixtures, a fireplace, and a beautifully updated bathroom with a shower set in stone. Prepare to be wowed with the bedrooms inside Smoky Mountain Splash! 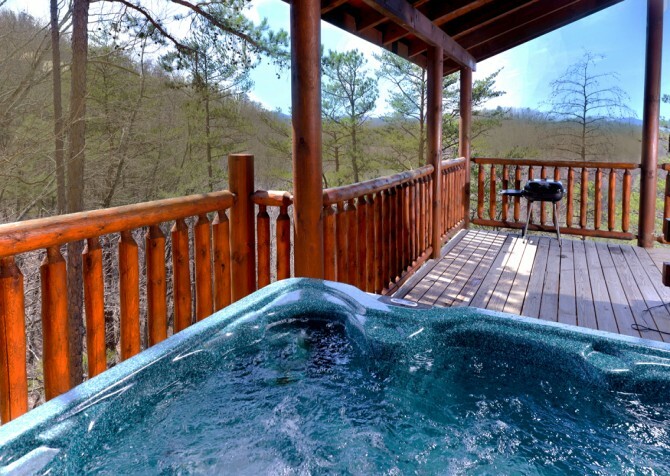 You’ll even have access to an indoor jetted tub, offering you the perfect way to unwind after shopping in Pigeon Forge or spending the day at Dollywood. One of the best parts about staying in the Smokies is being surrounded by the peaceful atmosphere of the mountains and trees. At Smoky Mountain Splash, you’ll have the best of both, along with plenty of outdoor space to enjoy them from. 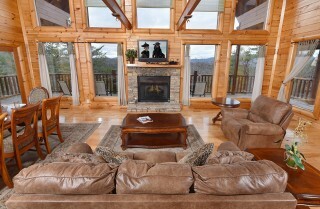 Take advantage of multiple sitting areas with patio chairs that overlook the rolling hills of the Smokies. And be sure to spend some time in your outdoor hot tub that also offers wooded views. 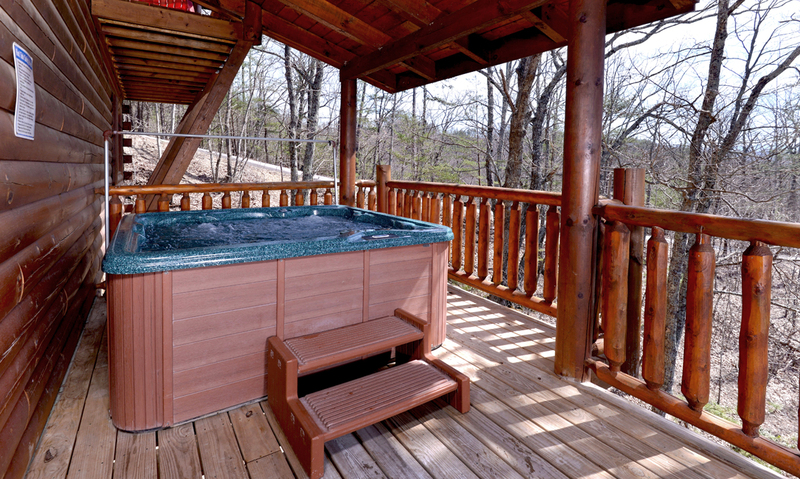 You can relax with friends after a long day of hiking or just use the hot tub as the perfect place to warm up on a chilly afternoon. You can even flip on the TV out on the deck when you want to watch your favorite show but get some fresh air at the same time! These outdoor spaces can be enjoyed no matter what time of year you decide to visit, so bring the family and get ready to spend some fun in the great outdoors at Smoky Mountain Splash! 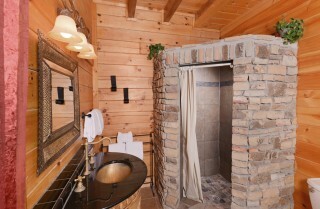 Smoky Mountain Splash is more than a place to stay in the Smokies. 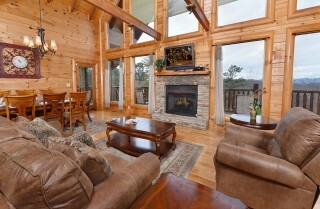 It’s convenient, luxurious, full of ways to entertain, and a place where you’re sure to feel at home. With additions like high speed wireless, a PlayStation 3, a DVD player, and a Blu-ray player, you won’t have to sacrifice the games, movies, or devices you’re used to just because you’re away. And with a washer and dryer and a charcoal grill, you’ll have options for taking care of laundry and cooking at the cabin that you won’t find in a downtown hotel. Even if you don’t plan on using all the amenities, it’s still nice to know you have the option during your stay at Smoky Mountain Splash. 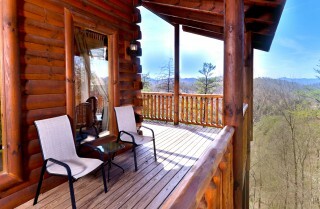 Take a turn on the Great Smoky Mountain Wheel. Delight your taste buds at Paula Deen’s Family Kitchen. Try a sample of old-fashioned moonshine at the Ole Smoky. This is just the beginning of what’s in store for you at The Island! 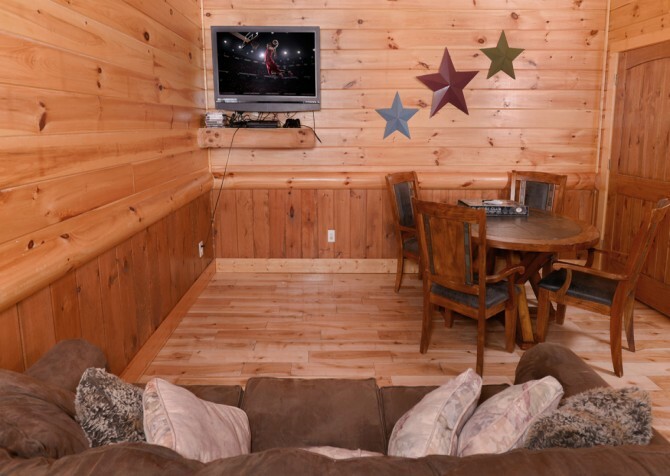 If you’re looking for some good clean fun that the whole family can enjoy, head to The Comedy Barn Theater. 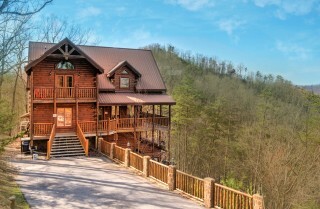 Their popular variety show includes magicians, ventriloquists, live music, and more! 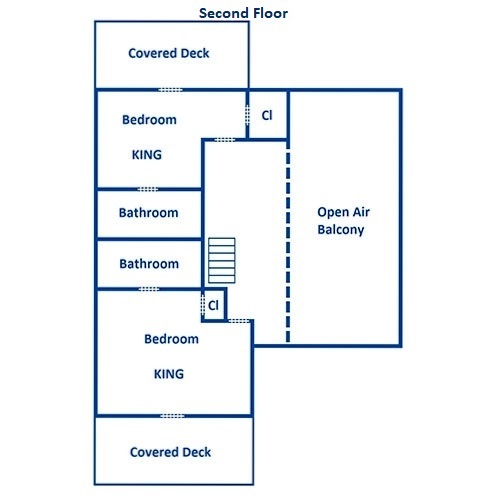 Laser tag isn’t just for kids and teenagers. 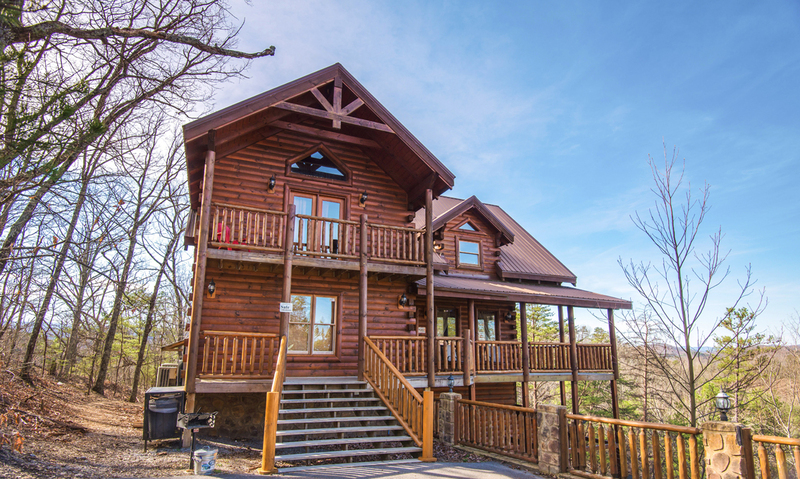 Even adults can have fun spending the afternoon at LazerPort Fun Center, where you’ll find blacklight mini golf, an arcade, an outdoor go-kart track, and a huge venue for laser tag!